The Food Alphabet and More: Wee Nam Kee serves up unli Hainanese Chicken and more!!!! Wee Nam Kee serves up unli Hainanese Chicken and more!!!! Happy Anniversary Wee Nam Kee! Yes Wee Nam Kee is 5 years old and going strong! And to celebrate 5 successful years of giving you only the best dining experience comes an offer you can't refuse. Hainanese Chicken Lovers unite! 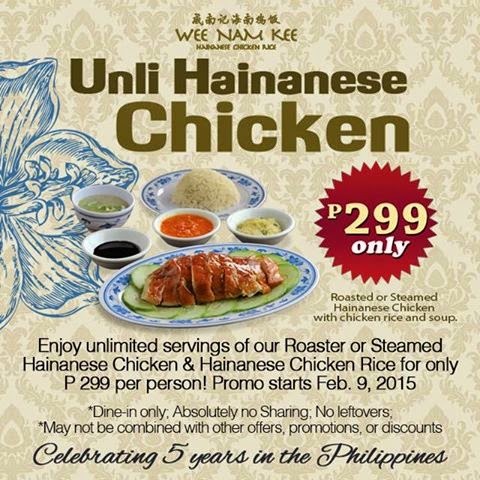 For only P299 per person, get to enjoy unlimited servings of Wee Nam Kee's world famous Roaster or Steamed Hainanese Chicken plus unlimited servings as well of their Hainanese Chicken Rice. Is this a dream? No, it's really happening! So be there on Feb. 9, 2015 and let's start munching! This is definitely a dream come true for me since I love Wee Nam Kee! This anniversary offer starts Feb. 9, 2015 until Feb. 13, 2015 only! Offer is available at all Wee Nam Kee branches! Visit them at Ayala Triangle Gardens, The new Glorietta 2, Trinoma, Ayala Fairview Terraces, Serendra, Promenade Greenhills and Alabang Town Center! See you at a Wee Nam Kee Hainanese Chicken restaurant on Feb. 9! This offer if for dine-in only, and of course there will be no sharing plus let's not leave left overs. Like them on Facebook https://www.facebook.com/WeeNamKeePH and be updated on their new offerings and promotions.